Whether a Restaurant, Industrial business, or Office - your workplace has safety requirements to comply with. These OSHA Compliance Packages address four compliance issues: first aid, bloodborne pathogens, personal protection, and CPR. 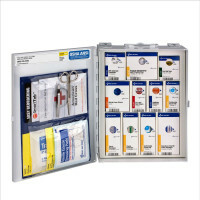 Complete sets so your business meets OSHA Regulations for 1st Aid, Bloodborne Pathogens & CPR! Why an OSHA First Aid Kit? 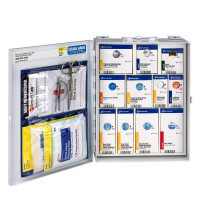 Every business needs to meet the standards set forth by OSHA, as well as local and state labor laws... A well designed OSHA Compliant First Aid kit will meet and exceed the OSHA Standards, as well as serving the needs for the target group for which that first aid kit was designed... based on years of study, accident and injury reports, and first aid logs, these kits exceed OSHA standards, and were designed with respect for American Medical Association (AMA) guidelines. Based on Federal OSHA Regulation Standard 1910.151.b: "Adequate first aid supplies shall be readily available." This rule applies to treatment of minor injuries that occur in the workplace. You should be concerned with OSHA compliance on both a federal and state level. Currently, 30 states follow the Federal OSHA regulations as stated above, while 22 states follow a regulation that combines the Federal standard and imposes an individualized state by state requirement. The state standard can be reviewed on the Internet or by contacting your local OSHA office. Both Federal and State OSHA regulations do include the 'non-mandatory' requirements that coincide with ANSI's first aid kit regulations. As a company, we feel that eventually, these agencies will adopt ANSI as part of their regulation. 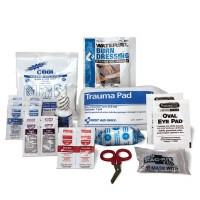 All our industrial first aid kits meet or exceed Federal OSHA standards. Additionally, our line includes metal and plastic unitized kits that meet or exceed Federal OSHA standards and exceed the new ANSI requirements. For more information on the new ANSI standards see the ANSI kits section. Looking for OSHA Compliance Safety Training or OSHA First Aid?